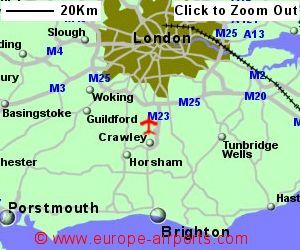 Then M25 is approximately 13 Km to the north of the airport and the M23 2 Km east, with a link into the airport. 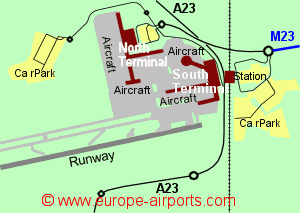 Gatwick airport has 2 terminals, the north terminal and the south terminal, approximately 1 km apart. Both terminals have short term car parks immediately opposite. The Gatwick Express rail link gives a 30 minute journey time to and from the city via the railway station which is adjacent to the South Terminal, and runs every 15 minutes. Several other rail services operate, including a direct link to Luton. There is a free transit train link between the two terminals, running every few minutes 24hrs a day, with a journey time of approximately 2 minutes. There are good bus services between the airport and London city or local areas(most stopping at both terminals. There is also a non-stop bus link between Gatwick and Heathrow airports, running upto 125 times per day, with a journey time of approximately 80 minutes. National Express coaches run to various destinations including Sutton. Mitcham, Streatham, Stockwell, Vauxhall, and Victoria for approximately 8 pounds. National also run a service to local hotels for approximately 3 pounds. Easybus run a service to Earls Court and West Brompton every 20 minutes during the day, with a journey time of 65 minutes. Within the 2 terminals at Gatwick (north and south) there are approximately 32 bars/restaurants, a large number of shops, Internet kiosks, and FREE WiFi Internet access for upto 90 minutes(there is also a paid service provided by Boingo). The Hampton by Hilton hotel is attached to the north terminal, as is the Sofitel, while the Premier Inn is opposite. London Gatwick airport has Airport Carbon Accreditation, at the Neutrality level. 45.5 million passengers passed through London Gatwick airport in 2017, an increase of 5% from the previous year, making it the UK's second busiest airport. 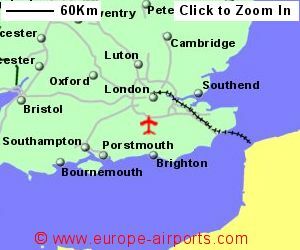 Gatwick has until recently, also been the world's busiest single runway airport.